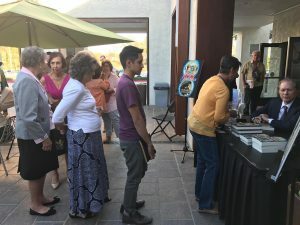 On November 13, 2016, I had my first combination book signing and concert at the Carlsbad City Library, in Carlsbad, California, sponsored by the Amateur Pianists of San Diego. We had an excellent turnout, estimated at between 60 and 70 people in attendance; some who had traveled a significant distance to attend. 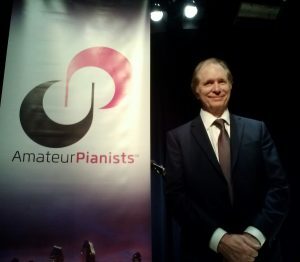 Many thanks to Glenn Kramer, the founder of the Amateurs Pianists, for sponsoring and supporting the event (and for taking some great photos); I also greatly appreciate my publicist, Paula Margulies, for putting the event together and helping me at the book signing table. Finally, I am grateful to my lovely wife, for helping to encourage so many family members and friends to attend. 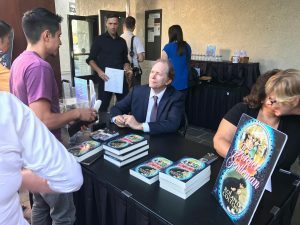 After receiving a very nice introduction from Glenn Kramer, I began my presentation, spending the first twenty or so minutes talking about my book, and then proceeded to play several compositions featured in Forever Gentleman. 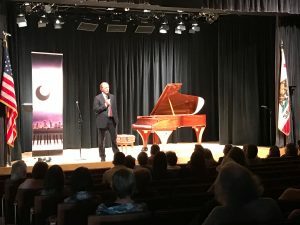 While I’m comfortable speaking in public (after many years as a trial lawyer, I should be), I am not terribly comfortable performing difficult pieces on the piano, in public. 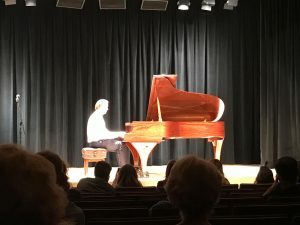 I had been practicing more than I ever have before in my life, particularly on Chopin’s Quatrieme Ballade, considered to be one of the most difficult pieces in the piano repertoire; there were several days where I spent three or four hours at the keyboard, working primarily on the Chopin piece. I knew going in that it would be difficult to get through the piece from memory, as I had just completed memorizing the last 3-4 pages of the twenty page composition a few days before the event. I had run through the entire piece perhaps twenty times after that by memory, and had only been able to get through it successfully about 15% of the time (or 3 out of 20). Now, those are not great odds for anyone. But, if you put the added pressure of performing in public before strangers (and friends and family, of course), it was nervous-time! You can understand why I would have loved to have had a couple more weeks to work on the piece. So, after talking about my book and trying to delay the inevitable, I attempted the “impossible:” an amateur pianist playing Chopin’s Quatrieme Balldade. On stage, in bright lights and full view of my listening audience, I sat at the piano and began playing the simple G octave above middle C, temporarily assured that the opening pages are relatively easy to play. Nevertheless, panic was beginning to set in as even the memory of the early pages required far more concentration than normal. The first 3-4 minutes of the piece went smoothly enough, but as I entered the complex pages of the composition, my anxiety intensified. Suddenly, in the middle of a passage I had played successfully countless times before, my mind went blank as to the next few notes. I stopped playing on stage and felt all the eyes of the audience upon me. I hurriedly ran to a nearby table and retrieved the sheet music for the piece (which I brought just in case such a disaster occurred) and continued playing with the music. However, since the piece was essentially memorized, I continued playing without looking at the music (but now, having lost my confidence, blanked out a couple of more times in areas where I had never had trouble before). 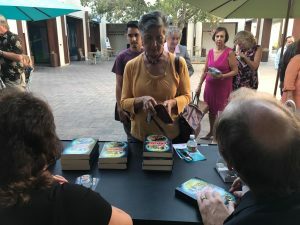 With beads of perspiration appearing on my forehead, I continued on until finally “thundering down the keyboard to the bass keys, signaling the end of the ballade.” Nathan Sinclair (the pianist in my book), I was not. But, just as in my book, the “applause erupted,” however, in this case from a very forgiving and generous audience. And then, I saw that most guests were standing and applauding! I am so very grateful for the audience’s very kind reaction. Although I had crashed, I hadn’t totally burned. At least I had made it all the way through the piece—beginning to end. There were more pieces to play and now with my confidence shattered, I dreaded performing the next piece: Liszt’s Concert Etude (Un Sospiro), which I have performed in public at least 5 or 6 times—it lasts only 5-6 minutes, compared to 14 minutes for the Chopin Ballade. With only a few faux pas, I somehow got through that piece and then played, with the sheet music (as intended), the Bizet Nocturne. Because time had run out, I thankfully was able to skip playing a Chopin Etude. The applause I received at the end of the concert melted my heart and then the book signing began. A long line formed at the book signing table, and for the next 20-30 minutes I signed book after book. I receive so many kind words from those who were present. Undeserved but much appreciated nonetheless. In the aftermath of the concert, I vowed to abandon the piano altogether. However, after a few days’ retirement, I found myself back at the keyboard. My publicist is now talking about arranging some more signings and concerts, and I became excited about the prospects of playing Chopin’s Quatrieme Ballade (and other pieces) again. With more time to prepare the piece, I just might be able to get through it entirely next time, without the sheet music. Bold words for an amateur pianist. Well, I plan on attempting the impossible again!